Hi! It's Jilly. : Mom's Monday Mingle- Join the Fun! Mom's Monday Mingle- Join the Fun! Hi! It's Jilly. 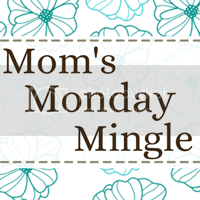 I'm happy to be co-hosting the Mom's Monday Mingle again with the lovely Jessica and Julie! It's always fun to meet new bloggers. Please link up your blog, and then do a little blog-hopping. If you are a new follower, leave me a comment so I can return the favor & follow you back!